We had a successful first meeting of the Roosevelt Community Cabinet on Thursday! It was great to bring together a diverse group of voices and have a discussion around our neighborhood school. The notes are in the link below. We had an excellent first Community Cabinet meeting last week. Please find the notes below. Thanks to all who came out! We’re excited to announce the MacFarland Middle School Community Cabinet members! These members will weigh in on school programming and community engagement among other issues as we prepare for the school’s opening. As many of you heard last week, MacFarland will be “jump starting” its 6th grade Dual Language Program next year. This will make the Cabinet’s work even more urgent as we prepare for its beginning next school year! Below is a snapshot of members and a quick introduction. You can reach out to your representatives directly by email, or contact DCPS.Planning@dc.gov with questions/comments. Describe your connection to MacFarland Middle School. I was raised in the Petworth neighborhood from birth and I graduated from MacFarland in 1987. I still have family and friends in the neighborhood and would love to see only great things occur with MacFarland. What was your favorite class in middle school? My favorite class was algebra, I enjoyed figuring out the end results of a problem. I knew you needed to be above average in counting or figuring out math problems because it directly relates to MONEY. Everyone loves to count money. What was your favorite class in middle school? Spanish-I have loved studying Spanish since 3rd grade when I decided I could be good at it. It led to a major in Spanish and Latin American Literature in college. My Spanish teachers were always awesome! Describe your connection to MacFarland Middle School. I have lived 3 blocks from MacFarland since 2003 and I was very upset with it’s closing. In 2008 I became a DCPS high school counselor so I feel even more strongly about the importance of middle schools. Currently I am due to have twins in November who will be looking forward to enrolling in 6th grade at MacFarland in 2027. What was your favorite class in middle school? Industrial Arts. I really enjoyed construction and the design process. Describe your connection to MacFarland Middle School. As a resident of Washington DC and as a Professional School counselor, I am in the business of education. I also believe in a quality education for all. What was your favorite class in middle school? History. I had an incredible teacher who was very passionate and caring. Describe your connection to MacFarland Middle School. My children are at West Education Campus. When MacFarland opens, it will be their middle school, so I’d like to see it succeed. What was your favorite class in middle school? Math / science. Describe your connection to MacFarland Middle School. I am connected to the middle school as a result of my relationship with Roosevelt SHS (RSHS). My daughter attended RSHS and I served as the President of the Parent Teacher Association for three years and Director of the Family and Community Resource Center for 2 1/2 years. Clearly, I understand the importance of a feeder school for the high school and what it takes for a successful school partnership. Additionally, our community needs a middle school. What was your favorite class in middle school? I really enjoyed junior high school because at that stage we started changing classes and sitting in one room. It also was greater exposure to athletics and I loved basketball and later played in school, college and the Air Force. Describe your connection to MacFarland Middle School. I have three children at Powell ES and am a resident of Ward 4. I want my kids and other area kids to have access to a middle school within their own Ward that they can be proud of and parents will want them to attend. What was your favorite class in middle school? My favorite class in Middle School was Language Arts. I loved to read and in Middle School we made the jump from just reading for comprehension to reading to understand plot lines and metaphors, and understanding how complicated story telling can be. Describe your connection to MacFarland Middle School. My family and I live in the MacFarland school boundary. Although our daughter’s (age 10 and 71/2) attend a nearby charter school, I recognize the importance of having a quality neighborhood school and I want to help make that happen. What was your favorite class in middle school? I went to a school system where the elementary went from K-6 and the high school went from 7-12 so I never really had a middle school experience. That said, my 7th grade homeroom was the shop class and it wasn’t necessarily my favorite class but I was amazed and excited that there were so many different types of activities and classes in addition to the typical math, science, language, etc. Describe your connection to MacFarland Middle School. I am a parent of a child who would attend the school during its inaugural year. What was your favorite class in middle school? Spanish because it allowed me the opportunity to attempt to learn another language. Describe your connection to MacFarland Middle School. It is the school closest to the girls for middle school and hopefully it’ll be a great community school for Ward 4. What was your favorite class in middle school? History. I always loved knowing where I come from and others around me and why things happened before us. I think it’s a great way to learn from mistakes. Describe your connection to MacFarland Middle School. I am a mom of a future DCPS student and looking forward to the return of MacFarland to Ward 4. What was your favorite class in middle school? My favorite class in middle school was my 7th grade history class. Over the winter holidays, our incredibly dedicated teacher transformed the classroom into a western ranch, helping to bring alive the stories of the Wild West that we learned about that spring semester. Describe your connection to MacFarland Middle School. While my son is a toddler, I have a vested interest in the education options and opportunities available to him and every child in my community. What was your favorite class in middle school? 7th grade English. I had one of the most dynamic instructors in all of my years of education. Describe your connection to MacFarland Middle School. My child currently goes to West and would go to MacFarland for middle school. What was your favorite class in middle school? I went to a Catholic school in Jersey City, NJ, and it didn’t really differentiate “middle school” from the rest of elementary school. We had the “basics” just like in the other grades and not much else (i.e., no art, music, science lab, sports team, etc). That said, I liked reading/English because I enjoyed reading generally and liked to read new things. Describe your connection to MacFarland Middle School. I’m a Petworth resident and future MacFarland parent (of a 15-month old) and educational professional focused on designing college and career readiness opportunities for all students. What was your favorite class in middle school? 7th Grade English — reading the Diary of Anne Frank inspired my love of literature and was the reason I ultimately majored in English in college. Describe your connection to MacFarland Middle School. I am the founder of the NW Saturday Academy, an out-of-school academic enrichment program that brings together youth from all over our Ward to study math, computer science and robotics. I am also active with the Ward 4 Education Alliance. What was your favorite class in middle school? Science, because we had a great teacher who could make even the most challenging topics and assignments come alive. His enthusiasm for learning was infectious and he gave us the power to ask, “Why?” at an important point in our lives. MacFarland Middle School Dual Language Program Starting Next Year! 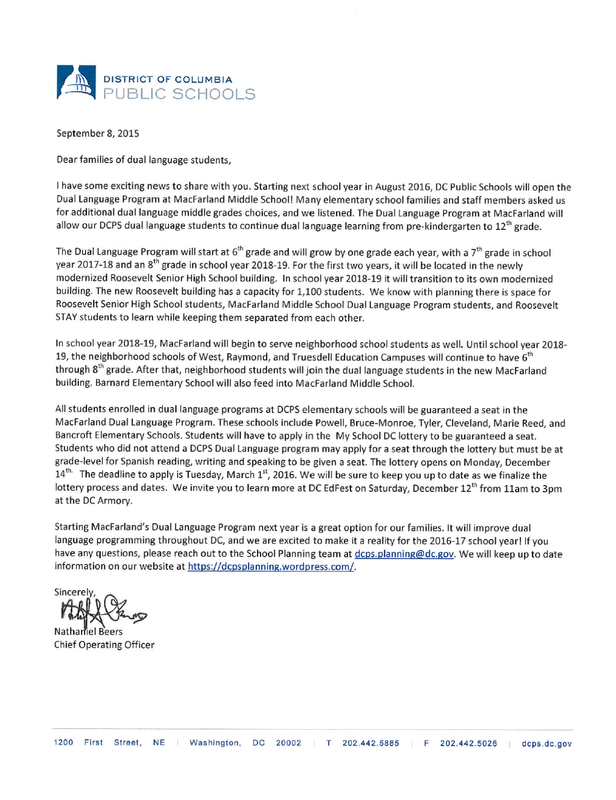 The DCPS Planning Team is excited to announce the “jump start” of MacFarland Middle School’s Dual Language Program next school year. 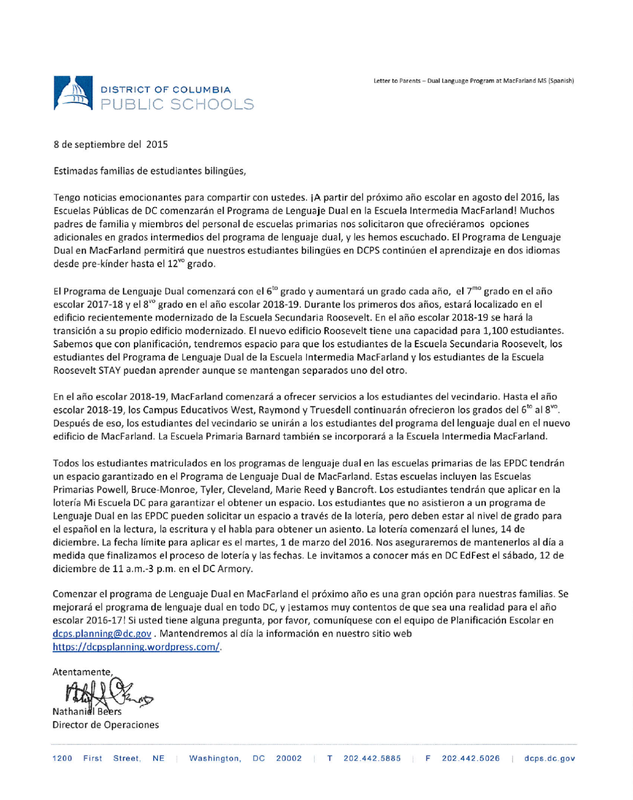 Please see the letter below from DCPS Chief Operating Officer Nathaniel Beers for details, or click on the pdf link here: MacFarland SY1617 Start Letter.